I think Gloria Uhler of Domestic Diva Online has a sharp pair of eyes!! She was watching the 2017 Screen Actors Guild awards earlier this year and spotted Octavia Spencer's awesome geometric earrings. This award winning actress chose a superb eye-catching black gown but it took someone observant like Gloria to be impressed with the turquoise drop earrings. 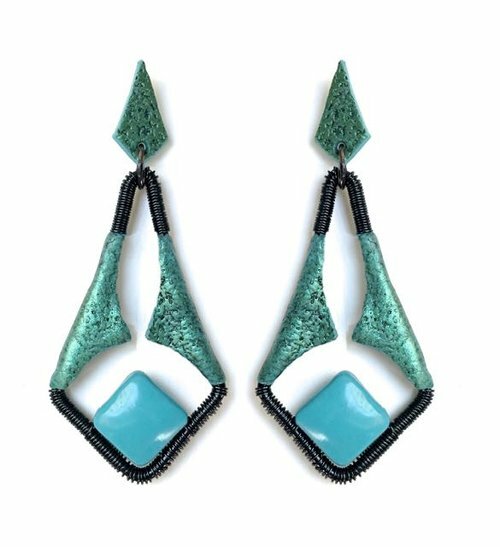 She used the inspirational shape to come up with her clever polymer clay and wire work earrings tutorial. She combines wire work with polymer clay texture work. I loved how she hid the wire gap in the frame with the polymer clay accents. You must check out how she used sandpaper and pigments to create the rough texture! Makes me think I should be paying closer attention to these award ceremonies for inspiration! I would have liked to have seen the original earrings Octavia was wearing but these are quite lovely looking. A nice shape and not hard to make.